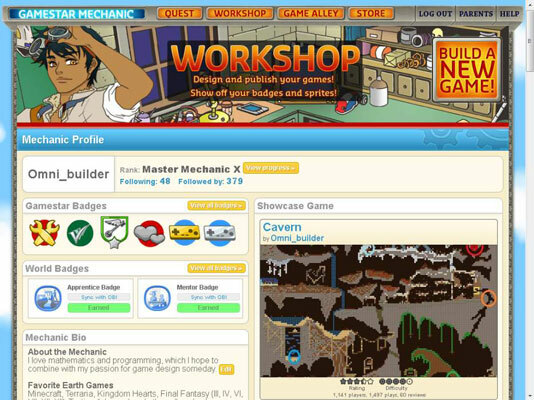 One of the Gamestar Mechanic site’s more complex pages, the Workshop displays a large amount of information about you and your games. You can build your own games from this page as well. The greatest teacher of game design is your own imagination — if you want to design to the best of your ability, you have to practice. To start designing a game, click the Build a New Game button at the top right of the Workshop, which opens the toolbox. From here, you use the toolbox to design your game. Make draft games. Design games without worrying about publishing them. Try out ideas and concepts. As long as you keep your imagination active, designing games is similar to riding a bike: After you gain some practice and understanding, you never forget it. Examine the Template Games. The Template games in your workshop are useful because they’re simple, editable, and useful to analyze. The Pinwheel and Dragons templates use only four sprites, which happens to be your starting set. Username: Your username is displayed at the top of the page, along with some information about your progress on the site. Rank: Next to your username, you can find your rank on the site. Following/Followed By: Below your rank and next to your username is a line of blue text containing two numbers. The first number represents how many other mechanics you’re following. The second number shows how many mechanics are following you. You can click these numbers to see your followers as well as the mechanics you’re following. Click the red X next to any user you’re following to stop following them. Gamestar Badges: Displays the six most recent badges you’ve obtained. Click the View All Badges button to see the rest, including those you haven’t yet obtained. World Badges: Monitors each world badge and your progress in completing it. Incomplete badges have a button that lets you continue your progression of them. Mechanic Bio: Contains personal information that you write about yourself. It includes two small chunks of text describing who you are and specifying which games you like. Showcase Game: You can set one of your published games as a showcase game. Other users who visit your workshop see this game immediately, along with its rating and popularity. Classes: This section appears if you’re in an official Gamestar Mechanic class, either as a student or teacher. Only you can see this section in your workshop. 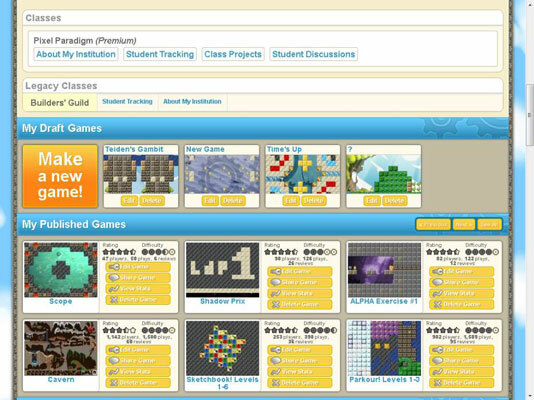 The Classes section contains links that allow you to view or control aspects of your class. Here are the remaining sections of the Workshop. A deleted game is gone forever, whether it’s a draft game or a published game. Previous, Next: Scroll through your games. See All: Display a special page with your draft games displayed on a grid. Alternatively, you can click the orange Make a New Game button in the My Draft Games section to begin work on a new game. This section appears in your workshop only if you’ve published a game that hasn’t yet been added to Game Alley. Games in the Pending Games section are ready to be published, but they contain custom backgrounds that haven’t yet been approved by the website moderators. If you create a new, custom background for your game, your game may remain in this section for a few days before it’s published. Share Game: Open a menu for publicizing your game. View Stats: See your level-by-level statistics. Delete Game: Remove the game. You can see all of your published games by clicking the buttons in the upper-right corner of this section. The Challenges & Contests section contains a number of challenges, either for earning more sprites or winning national acclaim. You can click them for more information. Use the buttons in the upper-right corner of the section to scroll through them. The Projects section, which appears only if you’re leading or attending a class, contains challenges just as in the Challenges & Contests section, but they’re personalized and sometimes required by your instructor. You may click them for more information. 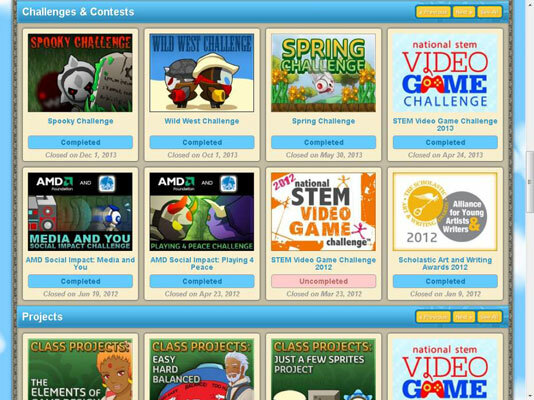 The Submitted Games section lists all the games you have submitted for contests or special quest missions. You cannot edit these games, but you can click the Get a Copy button to edit and publish a copy of the game. The challenge or quest corresponding to each game is printed under the title of your game, and can be clicked to view the page describing the challenge. Games in the Template Games section can be copied into your workshop, containing pre-created arrangements that you can edit any way you like. At the time of this writing, if you build a game from a template, you cannot publish it to Game Alley. The My Favorite Games section shows games you have marked as favorites. Other users can see and link to your favorite games, and you can scroll through them with the buttons in the upper-right corner of the section.